I have a driving lesson this morning. At 8am. And I haven’t slept all night. Because people, I get SO nervous when I think about driving. I took lessons last year and was actually ready to take my test and (according to my coach) had a significant chance to pass with succes. But I stepped out of the drivers seat and never took place there again. If it was up to me, I’d take busses and trains to get me from A to B for the rest of my life. But it’s not up to me anymore. I need a driver license for my internship. That internship starts February 4th, so that gives me 4 months and 4 days to get some serious driving skills and pass that test. “Hashtag dramaqueen”. On a brighter note, I scored at F21 last week. I was over the moon when I read they were opening stores in Belgium, but when I stepped in there the first time my dissapointment was huge. Terrible fabrics that glue to your tights, plastic gemstones and ripped sweaters galore, I was wondering where everybody found the pretty stuff. Last week was my lucky week and I scored this cute Tee, this tribal-ish necklace and a bat sleeved sweater in cute aztec print. To top it all off the mailman dilivered my Zalando package containing my ultimate fall basic: this navy skirt from Ichi. It’s all sorts of awesomeness. My week was all sorts of awesomeness. Except for the driving lessons… Oh boy! Great outfit, as always! And I'm sure you're gonna rock those driving lessons – it's always hard, I had a lot of troubles too. But as soon as you get the driving licence and start driving on your own, it's like a whole new world. You get so used to driving that it's the same as sitting on the couch in your living room (my mom told me this comparison once, lol, but it's actually like that!). Wanneer heb je die foto's genomen? 🙂 i wuf your f21 shirt, zo mooi! En snel nog eens afspreken! Driving is so scary when you start. I used to grip the steering wheel so tightly that my hands hurt after driving. I still did this long after getting my license. I also only got my license on the 6th try. Good luck to your driving lessons. You can do it. 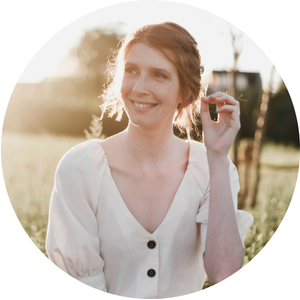 Dat shirtje is zo leuk! Ik ben echt nog nooit in een F21 geweest, shame on me! Great outfit; polka dots are so fun this year. Driving looks scary, but then you get used to it. Trust me. In any case, good luck. This is SO SO cute! 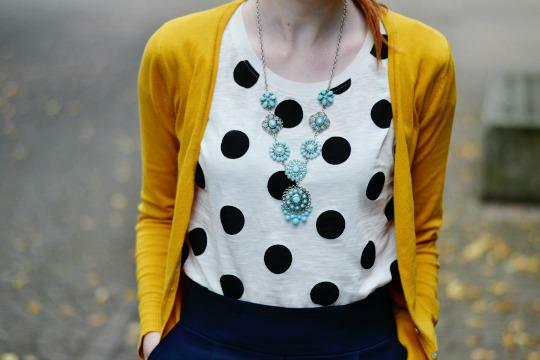 Love the polka dot top and the mustard cardi! You look cute as a button. Hope the driving test goes well; sure it will in fact! I've been waiting to see how you were going to style that necklace and I love it! Good luck with your driving! I was lucky when I was learning because I lived in the country and could drive up and down the highways. I hate driving in cities. Forever 21 is very hit and miss–just check every now and then and you'll stumble across great things. (: As for the license, if I could avoid needing to drive, I most certainly would. As things stand now, I am hoping to be able to move and rely way more on public transit. GOOD LUCK with your quest to get your driver's license! I adore your outfit! Your cardi is such a beautiful color on you and I love the big polka dots. When I first took my driving test, I royally failed the reverse-parking, but I still managed to pass…I still hate reverse-parking though haha. I wish you luck though, I hope you do well! omg these colours are pretty awesome!! And I love your trench! 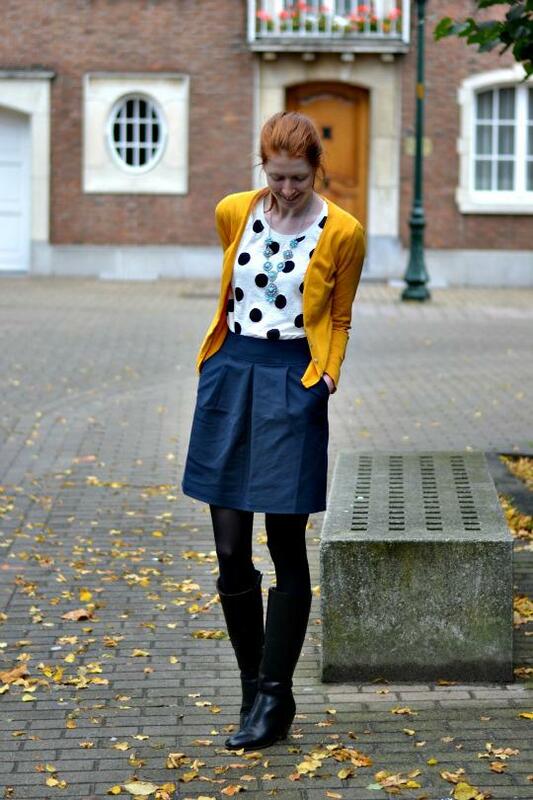 i truly believe this post has ALL my favorite elements….a stellar trench, divine dots & makes me happy mustard! lovely girl, i really would like to play this look up myself and will def be trying to recreate it. I love this outfit so much! That tee is awesome, I'll have to keep my eyes peeled for it next time I'm at F21. I hated driving until this year, I've grown accustomed to it! you can do it! Forever 21 is hit and miss for me as well. I love how inexpensive it is though! Aaahhh wat een super leuke outfit en succes met je rijles :). beautiful outfit and photos, love the trench!! 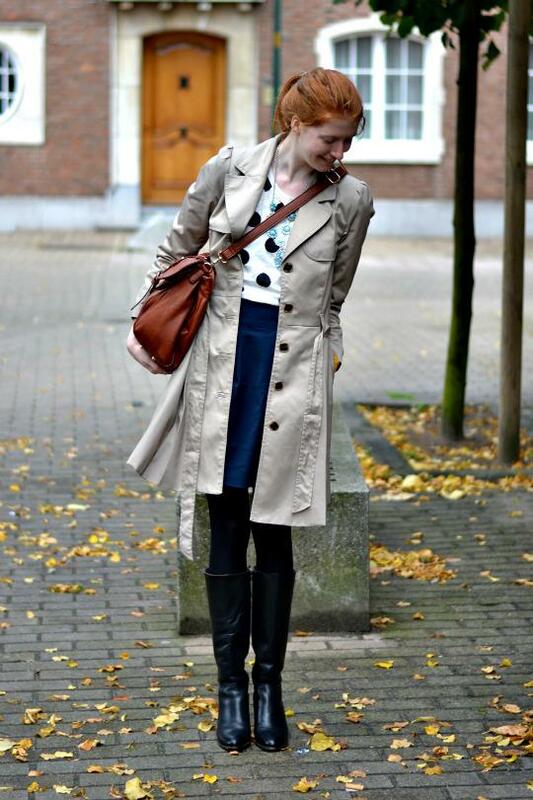 Can't get much cuter than polka dots and a trench! GORGEOUS outfit! The combo is incredible!!! Toen ik f21 binnenstapte was ik ook niet overtuigd, maar zie, jij hebt er toch al wat leuks gevonden! I LOVE this outfit, and you are so pretty!! You'll do well on your test, all you need is a lot of focus and confidence and you'll nail it. I past my first time but I was took me a a few years to gain the confidence to try for it, I was 18 when I got my drivers. Silly me. Cute cute outfit and I love your necklace ! totally just pinned this 🙂 I have a shirt with the same size polka dots and a mustard sweater! thanks for the inspiration! now if it ever gets cold enough here I can wear my cardis!